Best Breakfast Station of 2019 — Check our Breakfast Station Reviews! The most important meal of the day, is the one we forget about the most. Especially on busy mornings, breakfast is usually whatever we can get our hands on before we rush out the door. One new appliance is here to change that, and it’s called the breakfast station. These fun and innovative machines are here to help you serve up a hearty breakfast, even in a hurry. 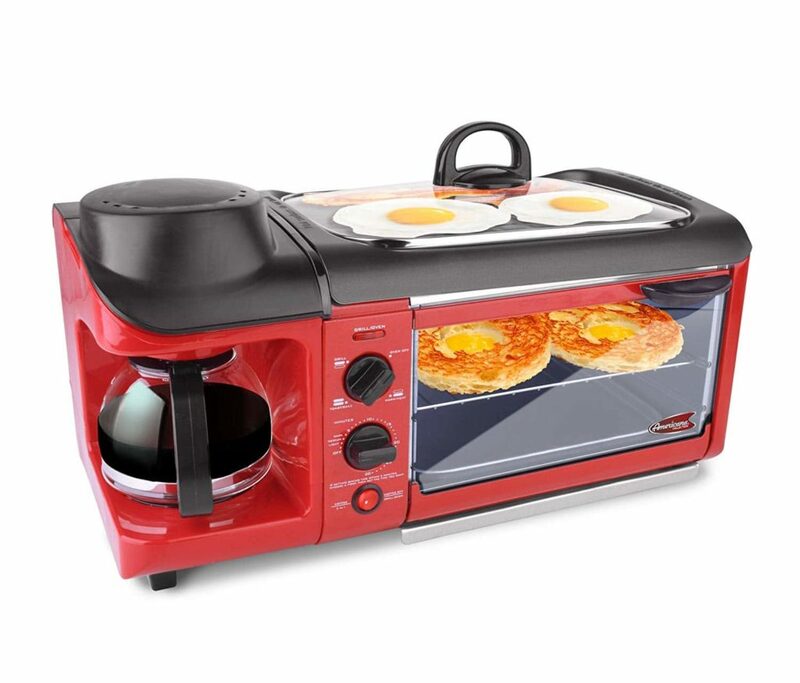 A 3 in 1 breakfast station makes it easy to cook eggs or bacon, toast bread, and brew fresh coffee in the same adorable appliance. They’re great for small space living (tiny homes anyone? ), dorms, campers, and even at the office! Let’s take a look at our top picks for best breakfast station of 2019, that are sure to turn you into a morning person. 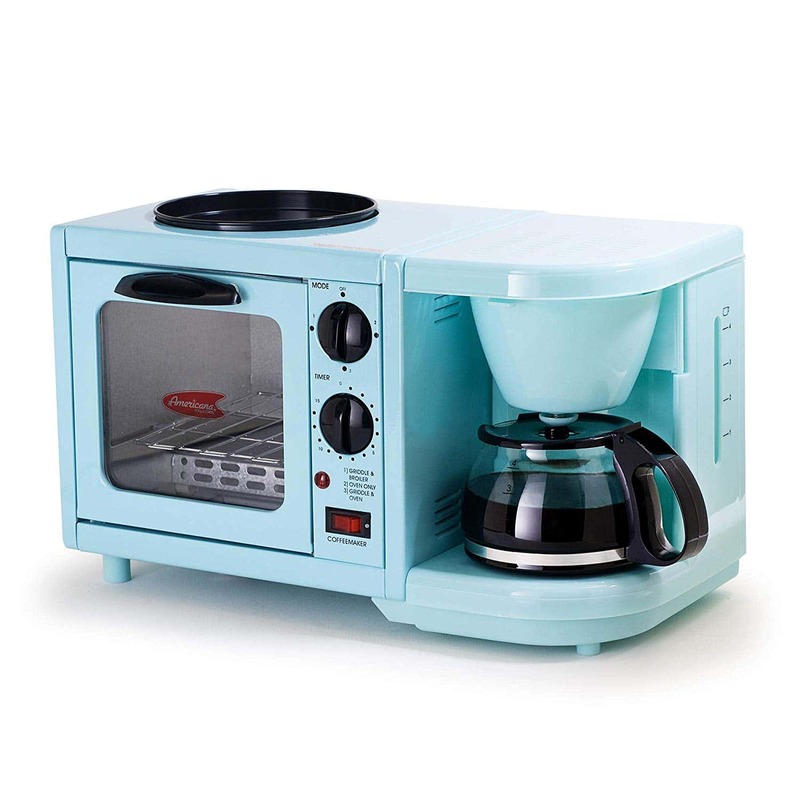 The Nostalgia breakfast station has an adorable retro look, and comes in a stylish aqua blue color. It’s a great size for families, with plenty of space to cook a complete breakfast. If blue isn’t your thing, this unit also comes in a lovely red color. Multi function toaster holds up to 4 slices of bread. Next, is the smaller version of the Nostlagia breakfast station. 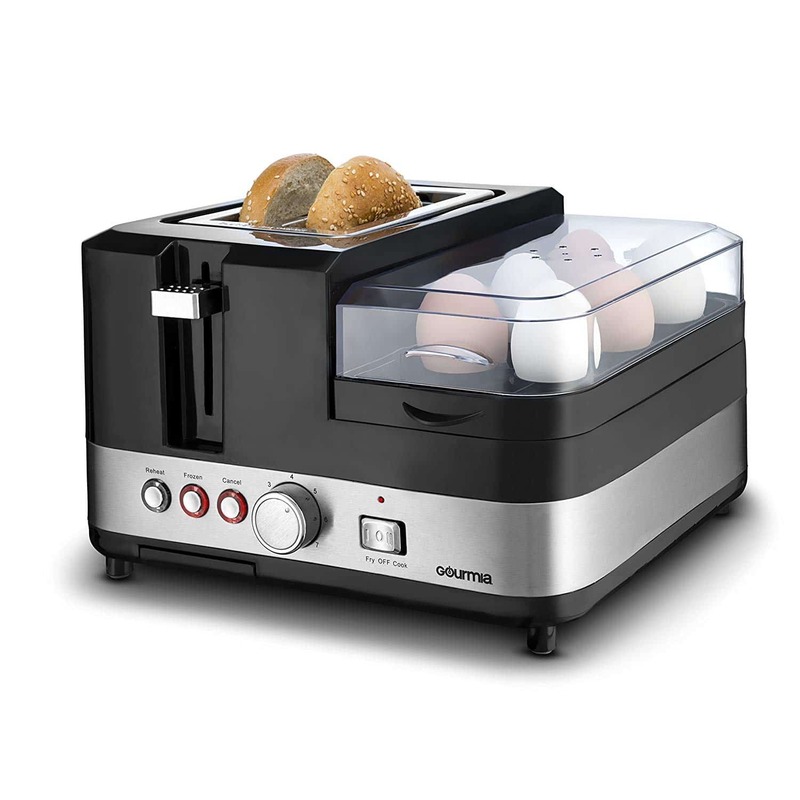 This compact appliance is ideal for a couples or individuals, with all the same convenient features of the bigger model. It’s small footprint makes it easy to move around, without taking up a lot of counter space. The Elite Maxi-Matic Deluxe breakfast station is family sized, and has all the features you need to make a delicious full breakfast. It comes in a cheery red color which is sure to work up your appetite! 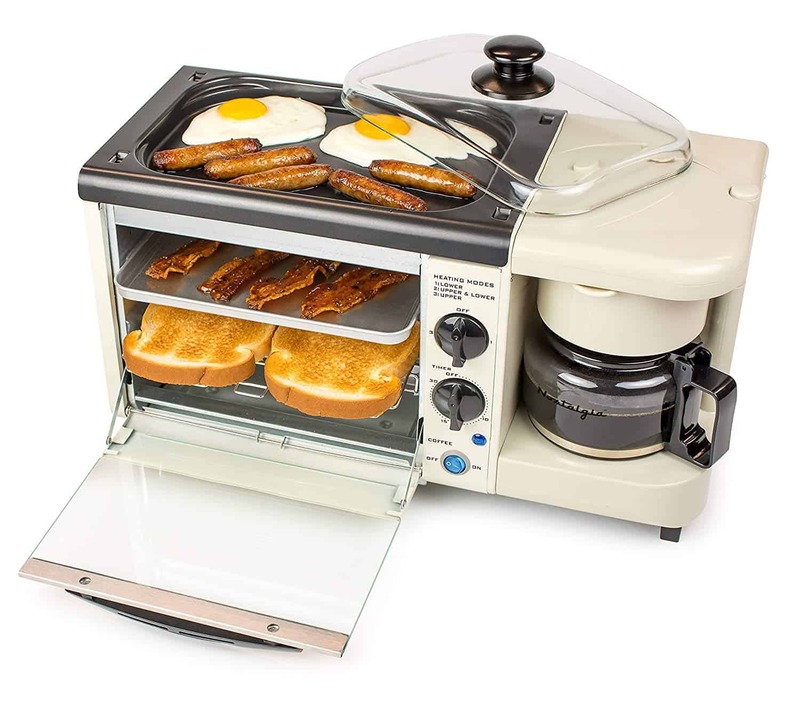 The Elite deluxe breakfast station is a more compact version of the bigger model, minus some of the bells and whistles. It’s smaller scale does make it easier to store, while keeping all the features you need to make a hearty breakfast at home. If the red color isn’t right for you, it also comes in a pretty aqua blue. 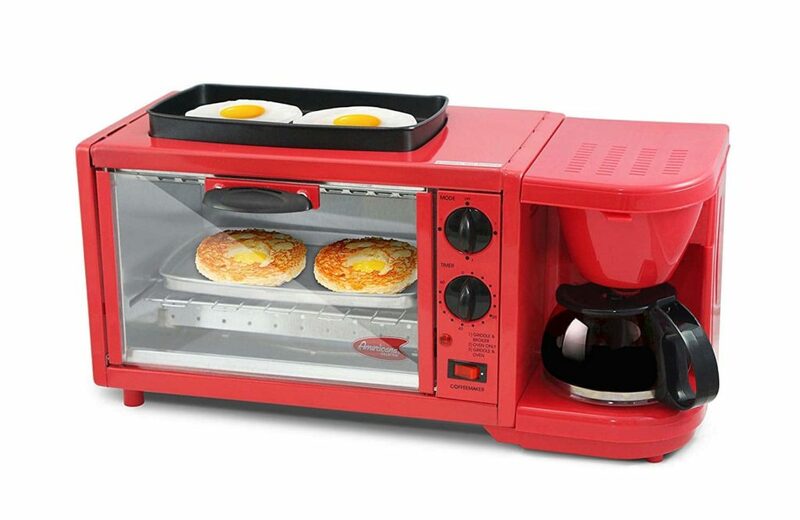 The Elite Maxi-Matic is an even smaller (and cuter) version of their best selling breakfast stations. It’s ideal for an individual, with the perfect amount of space to create a fabulous breakfast. It comes in a beautiful aqua blue color, as well as black, red, and white. 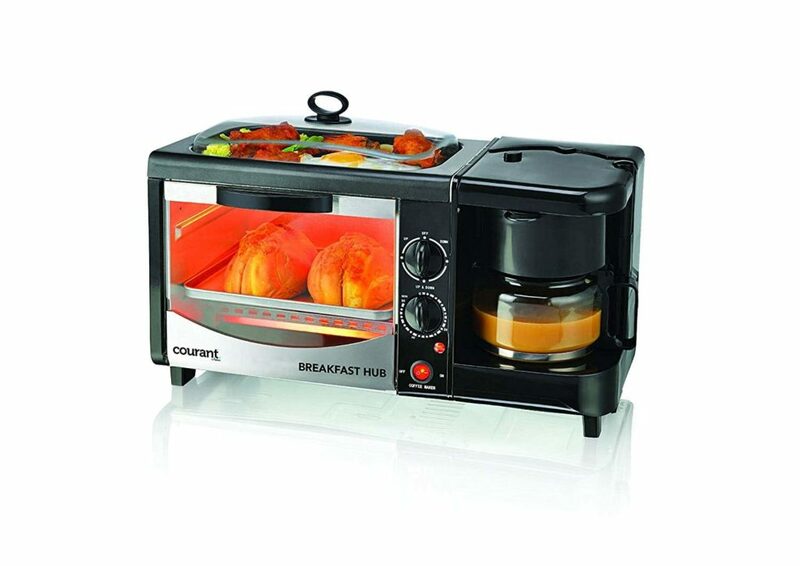 The Courant breakfast hub packs all the breakfast essentials in one compact space. While it’s not as attractive as some of the other options for best breakfast station, it has all the key features you need to make a hearty breakfast! The Gourmia 3 in 1 breakfast station is different from all the other models listed above, but still makes a delicious breakfast! If you won’t miss the coffee maker, this handy appliance can make you a healthy meal in no time. The Best Breakfast Station of 2019? 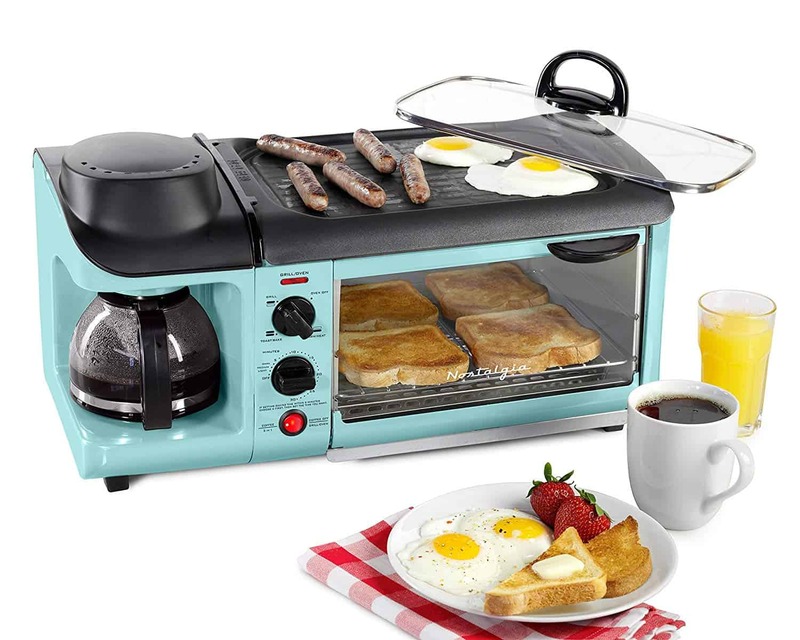 The Nostalgia breakfast station, with its adorable design, versatility and convenience is the best overall breakfast station. Thanks for reading out best breakfast station review, and we hope you enjoy cooking up the most important meal of the day!